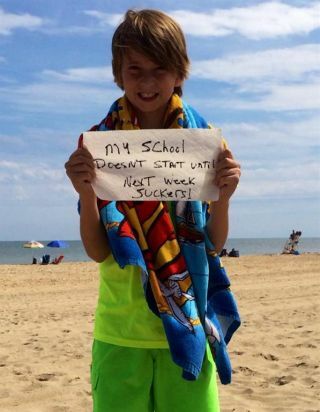 One great new social media tradition is sharing back-to-school photos. For me, the newsfeed pics started a few weeks ago, with friends in Southern states checking in with their fresh-faced kids from front stoops and bus stops. But yesterday came the Mother lode—hundreds of them, some sporting Catholic and charter school plaid uniforms, some in the latest public school fashions, even a few sporting homemade, homeschool costumes (my favorite comes from Jackson Forde’s dad, still on vacation, pictured on the left). For me, virtually sharing this most common ritual with friends and colleagues both old and new has become a very real positive force to counteract the current influx of bad news and bad memories this time of year can bring. In that spirit, I would ask you to share pictures of your first days in the classroom to our Facebook page. We’ll post some of our favorites in the next issue.